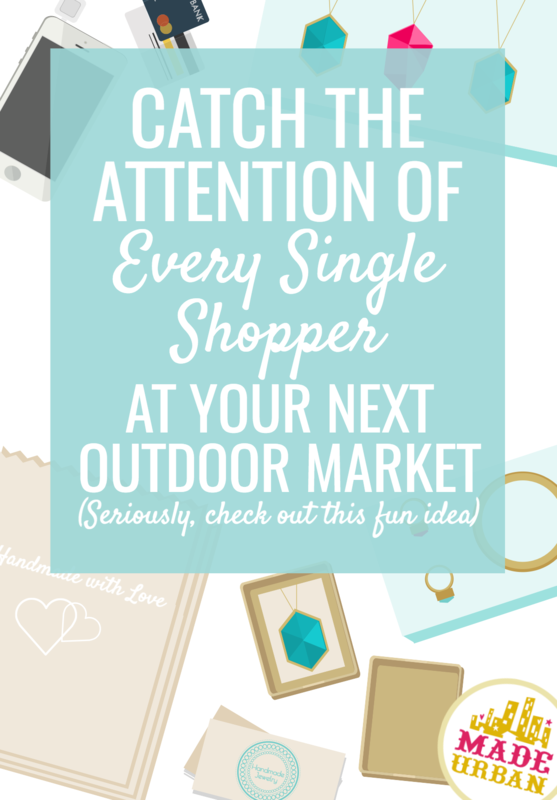 These are super easy ideas and can work regardless of what type of products you’re selling at an outdoor market. Aaaand, it will only cost you a couple pennies per customer. What you’ll gain are shoppers who are more enticed to come into your market booth and shop, stick around a little longer and be more likely to remember you and your brand. There are a few ways you can do this for very little cost. And if heat isn’t an issue, scroll down for another ideas that will make your shoppers’ time in your booth more comfortable and memorable! Or 10 UNIQUE BRANDING IDEAS FOR YOUR CRAFT SHOW BOOTH for ways to make your indoor craft show booth or table stand out. 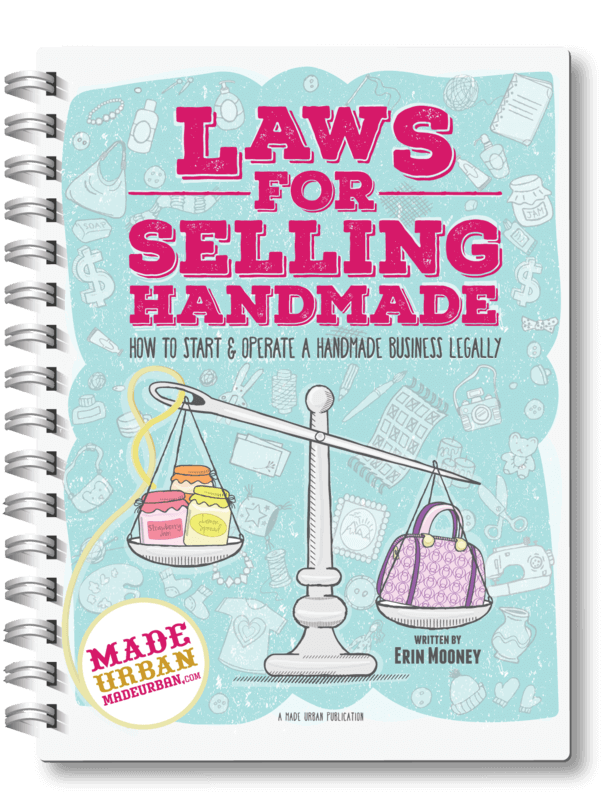 There are many laws a handmade business must follow so PLEASE CHECK WITH YOUR CITY ON LICENSES & PERMITS. Each jurisdiction is different on what you can and can’t give out (there’s actually a story about a church being fined for handing out bottles of water at a parade so be fully aware of what is and isn’t allowed). 1) Can vendors selling handmade products at an outdoor market hand out water for free or do they need a specific permit? 2) Can they serve tap water from a container or must they be bottles of water? 3) Are they allowed to add anything to the water such as mint or cucumbers? 4) Can they serve other beverages such as hot chocolate, coffee or tea? I got partial answers and directions to get in touch with several different departments, so leave time to gather your answers. You’ll also want to run it by the event organizer. If the main purpose of the outdoor market is based around food trucks, they may not want you handing out water and preventing some people from purchasing cold drinks. As well, the event may not have the proper permits for you to serve beverages. If you have the proper permits, are allowed to serve tap water from a container (bottled water may not give you the same return on investment) and the market organizer will allow it, idea #1 may work for you. Think about it. You’re out on a hot summer day, walking around the market and you’re thirsty. What’s going to catch your eye? A cold drink. Small table – something sturdy that won’t get knocked over, not too big but big enough that it gets noticed. Nice container – remember, everything in your space adds or detracts from the value of your brand. Don’t empty out a bunch of 4 litre milk jugs and fill them with water. Choose a container that goes with your brand. Dixie cups – you need these to be cheap and preferably environmentally friendly so you can recycle the used ones after the market. Cooler – Depending on how busy and how long the market is, you may need some backup containers to refill the jug and you’ll more than likely want a bag of ice to add throughout the day and keep it nice and cold. (Optional) Water flavor – lemons, cucumber, mint, lavender? If you’re selling scented or flavored products, try to choose something that goes with your brand. Again, ensure you have the proper permits for this. Adding a food item to your water may require you to have an approved commercial kitchen for safe food handling. Trash can – a container for people to dispose of their cups on the way out. You can find these at the dollar store and you don’t need a ton because they’re not to give away. They’re just for shoppers to use while they’re in your market booth. Battery-operated fans – depending on the size of your market booth, you probably only need around 5 fans. Consider how many people may be in your booth at the same time. You also may want some back up fans in case someone accidentally walks off with one. Extra batteries – if the fans get a lot of use that day, some extra batteries to replace the dead ones and keep the air flowing. Signage – you want it to be very clear that the fans are for your shoppers only and only to be used while in your tent. You may also want a sign reminding people before they leave to drop their fan back in the basket. Stickers – add a tag or sticker to the fans reading: PLEASE LEAVE WITH __________________ (your business name). If anyone mindlessly walks out with the fan, they’ll know where to return it. This option would be an expense but you could get some great advertising through people walking around the outdoor market, fanning themselves with your logo. Check out printing websites by Google-ing “promotional fan printing”. Depending on the style of fan you want, you can have some printed for as low as $0.28/fan. Simply a table, a basket and a sign to create a station and let shoppers know what it is and who it’s for. BONUS IDEA: You could also sell your paper fans. If it’s a really hot day, people may be willing to shell out a few bucks to get some relief from the heat. You could even make the fans yourself. Here are a couple DIY’s: Paper fan 1, Paper fan 2, Paper fan 3. Any of these ideas can work inside your market booth as well. If it’s a busy market, you may not want to risk people who have no intention of coming in to check out your work, using all your supplies. If you feel it would be better to keep the station inside your booth, get creative with the signage. From there you could use a couple of arrow cutouts to point shoppers towards your station inside the tent. This way may work just as well and get people curious enough to head in and ask you about it. You could also use a prop. An enlarged photo of a cold glass of water or an oversized fan will give them a hint. This one will take less work and can be used over and over at each outdoor market during the summer. Or you could look into solar powered fans. Again, use a sandwich sign outside your market booth or a large hanging sign near the entrance that grabs the attention of people passing by. STEP INSIDE & ENJOY MY AIR CONDITIONED TENT WHILE YOU SHOP! When people are uncomfortable, they automatically look for ways to become more comfortable and notice any items that will help them do so. It’s like when you’re watching TV and you’re thirsty. The story line has nothing to do with what the actors are drinking but you can’t help but focus on the drink they have in their hand. Or when you’re so incredibly tired that every flat surface looks like a good place to lay down. If it’s a hot day and people have been out walking around the market, they’re likely a little thirsty and hot. A jug full of ice cold water with beads of condensation dripping down, is bound to grab their attention. How many market vendors have thought about their shopper’s comfort? Most are so focused on making that sale that they lose sight of small details. 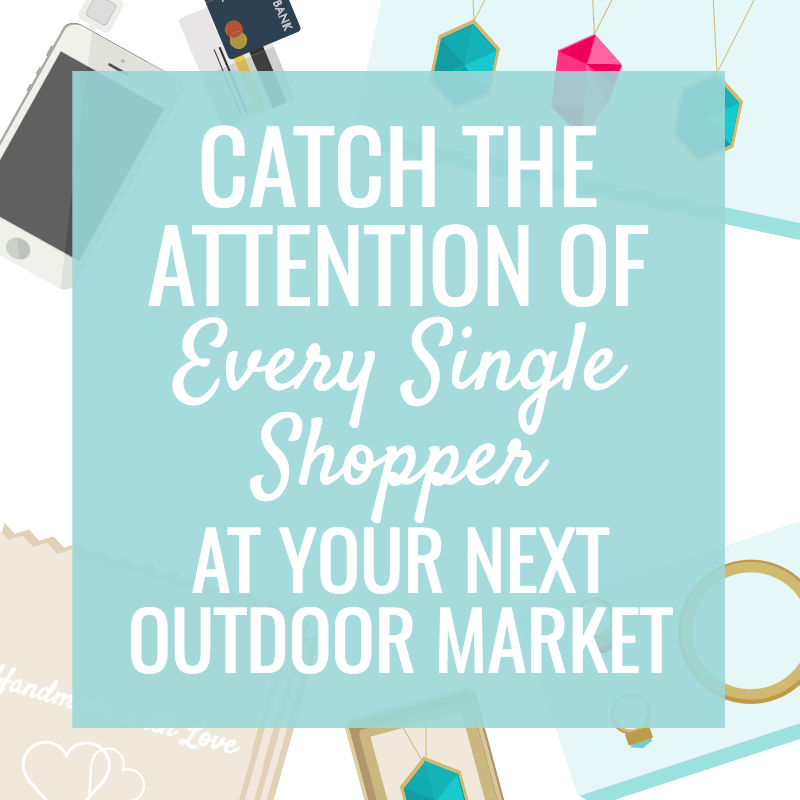 In a sea of market vendors, shoppers are going to notice the one doing something different. They’ll also be more likely to remember you after the market. How many booths and vendors did they walk past or into that day? How many did they get to feel comfortable, refreshed and better walking out than they did coming in? Hopefully just one; yours! Want more ideas for making your craft show display standout? Check out my FREE challenge: 5 DAYS TO A STANDOUT DISPLAY. I’ve personally never shopped in a store that hands me a glass of champagne to sip while I shop but when I’ve seen it done on TV, I immediately think luxury. No, you’re not handing out champagne but you’re adding a little extra for your shoppers, which adds to the whole experience. Imagine trying 2 different spas for massages. They both offer an hour-long massage but one business has you change in the room and go under the covers to wait for a masseuse. When she comes in the room, she speaks as though she’s asking for your order at a noisy diner. You can also hear the other staff chatting in the hallway. The other spa leads you to a change room and offers you a lush bathrobe and tea to sip while you wait for your masseuse. The waiting room has magazines, comfy couches and snacks in case you’re hungry. The masseuse speaks to you in a very gentle tone and soft music plays in the massage room to help you relax. The bathrobe, tea, music and masseuses mannerisms all add to your experience and lead you to believe it’s more valuable or expensive. Which leads to you willing to pay more. It helps create a great experience for your shopper and that’s what branding is all about. As consumers, we’re more likely to remember experiences and the feelings we get from people, places and things than facts repeated to us through a sales pitch. And we only share really great or really bad experiences with others. Just like the spa mentioned above, you’d likely to talk about and recommend the relaxing spa to friends. You may also tell people about the not so relaxing spa, but sharing your experience wouldn’t encourage others to check it out and would likely steer them away. If it’s a chilly day instead of hot, offer a hot drink from a thermos. AGAIN, CHECK WITH LOCAL LAWS TO SEE WHAT KIND OF PERMITS YOU NEED AS WELL AS WITH THE MARKET ORGANIZER. If you’re offering something like hot chocolate or coffee, you will most likely require an approved commercial kitchen for preparation and a food-handling permit. But since you probably won’t be dealing with as high of traffic on a cold day as on a hot one, you could splurge and purchase a box of coffee that serves several people, from McDonalds or another local coffee shop. Instead of fans at the front entry, have a basket of blankets they can throw over their shoulders and warm up under while they shop. Instead of an air conditioner in your tent, bring a portable heater. You may also be interested in my FREE challenge over 10,000 people have signed up for: 5 DAYS TO A STANDOUT DISPLAY. Lean more about the challenge here or sign up below! It will walk you though the exact steps needed to create a powerful, sales-provoking display. The information contained in this article is given as general information, and does not consist of legal advice. The information herein is provided by non-lawyers without any legal representations; it is not an alternative to obtaining legal advice, and should not be treated as such. If you have specific questions regarding a legal matter, you are urged to contact an attorney or other professional legal service provider. Nothing contained in this article will act to limit our liability in any way.